A researcher at the Weldon School has won a prestigious Scientist Development Grant from the American Heart Association designed to help and support promising young investigators. 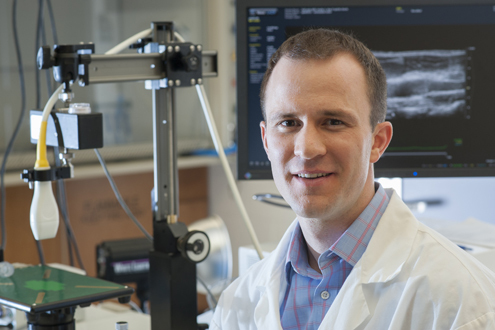 Craig Goergen, assistant professor of biomedical engineering, was honored with the award as a "highly promising" investigator conducting outstanding research in the early stages of his career. The grant supports a collaborative effort to develop a novel imaging system that can characterize and monitor vascular disease, including abdominal aortic aneurysms (AAAs). The team of researchers includes Goergen; Ji-Xin Cheng, professor of biomedical engineering and professor of chemistry at Purdue; Kimberly Buhman, associate professor of nutrition science at Purdue, and Michael Murphy, associate professor of surgery at IU School of Medicine. An aneurysm occurs when part of an arterial wall weakens, allowing it to expand abnormally and eventually rupture, leading to internal bleeding and possible death. Aneurysms can occur anywhere, but AAAs occur in the largest artery leading from the heart that supplies blood to rest of the body. Unfortunately, AAAs are often asymptomatic until they rupture, and it is estimated that at least 90% of patients with a ruptured AAA die before arriving at a hospital. In the United States, AAAs account for roughly 16,000 deaths and 150,000 inpatient hospitalizations per year. 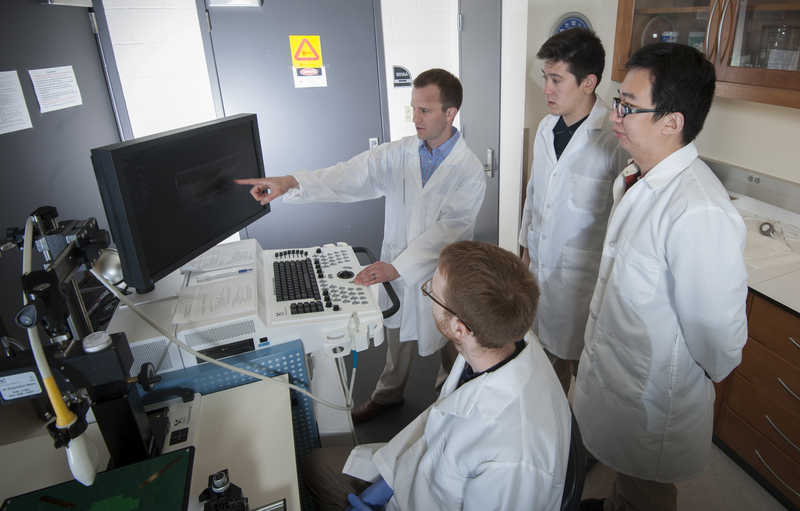 Pictured at right: Goergen with graduate students Frederick Damen, Rui Li, and Evan Phillips. Once it is diagnosed, there are no current proven therapies for aneurysms smaller than five centimeters, and this is where the team hopes to make a difference. One challenge associated with diagnosing and treating aneurysms is that it is not known how the composition of the arterial wall affects AAA growth and rupture risk. Some aneurysms expand, increasing the risk of rupture, while others are stable and do not expand. In the four-year study, entitled “Photoacoustic Imaging of Abdominal Aortic Aneurysms,” the team will study the relationship between aortic wall content, expansion rates, and rupture risk using an animal model. A non-invasive imaging system will be developed which can characterize aneurysm disease within the body by using a new technique called vibrational photoacoustic imaging. “By studying the relationships between aortic wall composition, causes of expansion, and rupture rates associated with those variables, we may be better able to determine at an earlier stage than is currently possible which patients are at greater risk of aortic rupture,” said Goergen. The imaging system may ultimately be used by physicians to diagnosis patients with AAA and identify those patients at increased risk of aortic growth and rupture. Long term, the team hopes to help develop and evaluate new treatments for AAA.